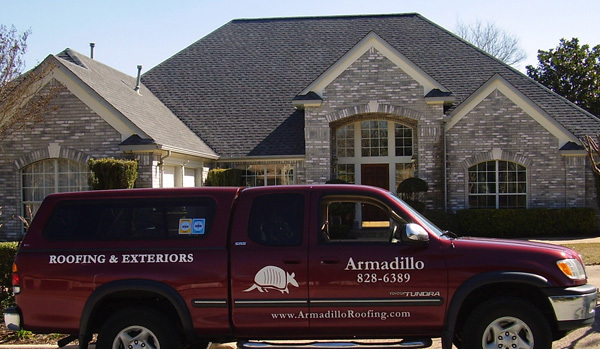 Armadillo Roofing provides shingle residential roofing materials and installation. Roofing shingles, when installed correctly, overlap one other as individual pieces. We use a variety of roofing materials when applying asphalt shingles to your home. We recommend the use of fiberglass asphalt shingles because of their lightweight build, fire resistance, durability and impressive longevity. So, if you want shingles, the most cost effective residential roofing material, we would recommend fiberglass asphalt shingles as your best option. We provide a wide variety of shingle residential roofing choices. Each shingle type has its unique pros and cons and we’ll provide a free, no cost consultation to help you select the ideal shingle solution for your unique Austin residential roofing needs. Flat roofing systems have become much more prevalent in today’s society. Flat roofs are used quite frequently in countries like Mexico, which have a dry climate. But, they’re becoming more popular for a lot of other reasons. As an example, some of our customers prefer flat roofs so they can utilize them for functions on their roof, or get a nice view of their surroundings from above. Others prefer a flat roofing surface because they help moisture run off easily due to their slight incline. Regardless of your reason, Armadillo Roofing will always help you choose the right roofing preference quickly and at a fair price. Residential roofing contractors used gravel for flat roofing surface material in the past but recently have stopped because it can be susceptible to ice dams. Ice dams can cause a flat roof to sag over time – due to the combination of weight and moisture – defeating the purpose of a “flat” roof as an architectural choice. We currently use different roofing materials to engineer our flat roofs, including modified bitumen, polyvinyl chloride, thermoplastic polyolefin, and turbo seal. We’ve also shifted to perpetual membrane sheeting for installing our flat roofs. We’ve found that perpetual membranes are much more resistant to accumulating pools of water during the rainy seasons. 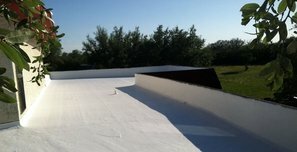 We also use top quality adhesives to bond together multiple sheets in order to offset the penetration of wind and water with all of our residential flat roofing structures. Residential flat roofs are still more susceptible to wear and tear, especially if additions (i.e., upgrading heating and cooling apparatuses) are implemented. Because of this, we don’t recommend the use of a flat roof as an used functionally without a additional roofing support systems put in place: like topsoil, stones, or some sort of wooden deck to protect the membrane of the flat roof. Fortunately, flat roofs also have several distinct advantages. As an example, residential flat roofing is the most cost-efficient commercial roofing solution because the whole roofing area can be used for recreational purposes. We also recommend a flat roof if you plan on installing a solar panel system in the future due to logistical convenience. 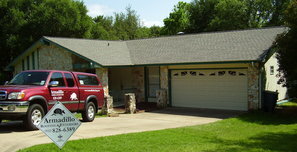 Armadillo Roofing is renowned for its tile roofing techniques in the Austin residential roofing community. We recommend tile roofing because there are lots of architectural choices to choose from. Some of the styles that we can provide our customers include colonial, avant-garde, contemporary and mediterranean. Our residential roofers enjoy working with and installing tiles due to the vast array of styles, as well as their diverse color palette. In addition to their stylish and multicolored variety, tiles also come in all shapes and sizes. They can be designed to be flat, round, or protrude or retract to give a concave or convex effect. 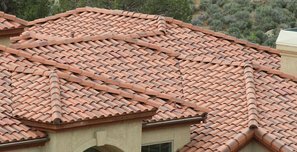 There’s diversity that only tile roofing can produce, as well as how durable, energy efficient and low-maintenance they are for decades after installation. Tiles are also very resistant to the elements of wind, hail, and snow. One of the reasons tiles are so in demand is because of the proven track record that tiles have in the Austin area. 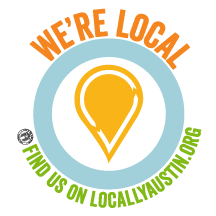 Tiles have proven their resistance against the elements and have been used in the Austin area for almost a century. Hence, there are several advantages to using tiles as your residential roofing choice, including their remarkable durability, diversity, and cost-effectiveness. We highly recommend metal roofing due to its extraordinary balance between durability and style. Metal residential roofing is fire resistant, immune to most of nature’s forces, and very energy efficient. We’re extremely experienced in metal residential roofing systems. Generally, we use tiles or pieces of metal to create our metal roofing systems, with a form of galvanized steel – that is corrugated – to form our metal sheeting systems. 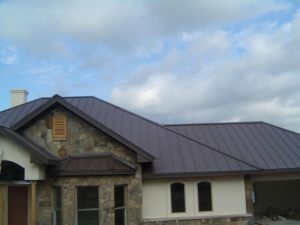 Residential metal roofing systems have some distinct advantages over other roofing materials and systems. Due to the light weight of metal materials our installation crews can easily assemble or dissemble metal roofing materials, making it extremely portable. Also, our metal utility and agricultural metal panels tend to last 25 years or more. Thus, we believe that metal roofing systems are a great choice because they’re portable, lightweight, and durable. The roofing industry has developed special metal amalgams, made of copper and zinc hybrids to further increase the durability and strength only metal roofing systems can provide – while reducing the costs substantially. We strongly recommend metal roofing systems if your property is spacious due to the impressive strength to weight ratio it provides. In addition to all of the benefits we’ve mentioned, metal roofing systems are also resistant to elemental forces like hail, fire, wind, and snow. As a matter of fact, we recommend metal roofing systems as your first choice if your home is located in a northern or mountainous region due to their snow shedding abilities. As for the environmentally conscious, we recommend metal roofing systems due to their biodegradability. Copper and aluminum materials are used that are made up of 90% recyclable material. Thus, our residential metal roofing systems are highly flexible, energy efficient, and need minimal maintenance. However, metal roofs are not without their minuses. Due to metal expanding via heat, you have to take into account the loud noise from materials striking it that that may develop over time . Metal roofing materials also tend to be more expensive than other materials. Overall, however, we believe that metal roofing systems’ pros outweigh their cons. If you want to speak to a professional, licensed and insured, residential roofing contractor to discuss your options for your roof installation, give us a call at 512-333-ROOF (7663) and we’ll schedule a free, no obligation consultation to help you make your best, most cost effective choice.